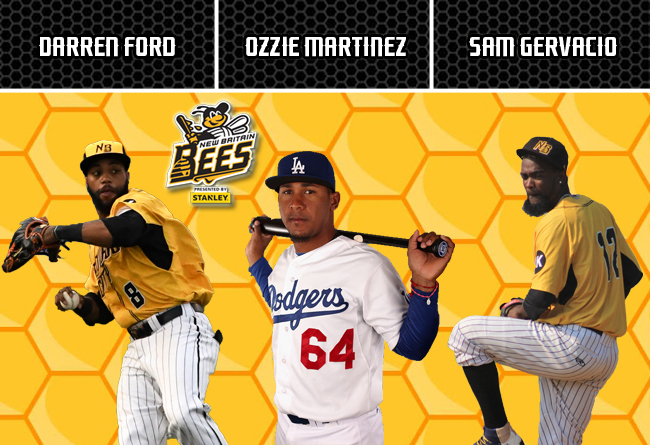 (New Britain, Conn., March 5, 2019) – The New Britain Bees today announced the signings of outfielder Darren Ford, infielder Ozzie Martinez, and pitcher Sam Gervacio. Darren Ford returns to the Bees for his third season in the Atlantic League and 15th of professional baseball. Last year with New Britain, the former big leaguer appeared in 122 games and posted a .276 batting average with 22 doubles, seven home runs, 74 runs scored, 38 RBI, and 36 stolen bases. The 33-year-old began his professional career with the Milwaukee Brewers after being selected in the 18th round of the 2004 amateur draft. He spent four seasons with the Brewers organization before being traded to the San Francisco Giants as part of a deal for Ray Durham. After two successful campaigns in the minors with San Francisco, Ford made his Major League debut in 2010 for the eventual World Series Champion Giants. He would again appear in the big leagues with San Francisco the following season. The speedster appeared in a combined 33 games during his big league career, collecting a .286 batting average with eight runs scored, and nine stolen bases. Over the course of 1,331 career minor league games, Darren has comprised a .265 batting average with 66 home runs, 461 RBI, 814 runs scored, and 495 stolen bases. Ozzie Martinez joins the Bees for his second season in the Atlantic League and 14th of professional baseball. Last year, the former Major Leaguer appeared in 105 games with the Road Warriors, and posted a .256 batting average with 15 doubles, seven home runs, 42 runs scored, and 27 RBI. The 30-year-old began his professional career with the Florida Marlins after being selected in the 11th round of the 2006 amateur draft. After five impressive campaigns in the Marlins organization, he made his Major League debut in 2010 at the age of 22. Martinez would again appear in the big leagues with Florida the following season. Following his stint with the Marlins, he would also spend time with the Chicago White Sox, Los Angeles Dodgers, Atlanta Braves, Baltimore Orioles, and Chicago Cubs organizations. The slick-fielding infielder appeared in a combined 34 games during his big league career, collecting a .258 batting average with four doubles, eight runs scored, and three RBI. Over the course of 1,202 career minor league games, Ozzie has comprised a .254 batting average with 223 extra base hits, 361 RBI, 477 runs scored, and 101 stolen bases. Sam Gervacio returns to New Britain for his 14th season of professional baseball and fourth in the Atlantic League. Last year with the Bees, the former big leaguer made 51 appearances, posting a 2.52 ERA with two saves and 77 strikeouts in 64.1 innings pitched. Gervacio began his professional career after he signed with the Houston Astros as a free agent in 2005, and made his major league debut in 2009. In two seasons with the Astros, he appeared in 35 games and went 1-2 with a 3.65 ERA and 28 strikeouts in 24.2 innings of work. His previous experience in the Atlantic League came with the Bridgeport Bluefish from 2015-16. Over the course of two seasons, Sam appeared in 82 games, while posting seven victories with a 3.36 ERA and 94 strikeouts over the course of 88.1 innings of work. He holds a record of 39-39 with a 3.30 ERA, 105 saves and 776 strikeouts over the course of 656.1 innings in 501 career minor league appearances.